i dont know where to begin! i think my horse craziness was a result of the my little ponies i started playing with as a toddler. 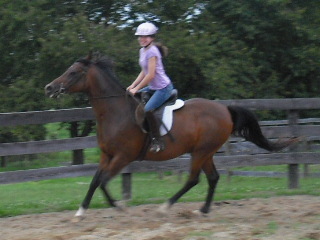 but since then i have upgraded to breyer model horses, to hunter/jumper lessons, to getting my own horse! my horses full name is Catch The Wind. but he has other nicknames such as Catch, pretty boy, and he is known at my lesson barn dominated by hunter ponies as "alyssa's crazy arabian".